The church of St Carantoc at Crantock is a minor masterpiece. 1. 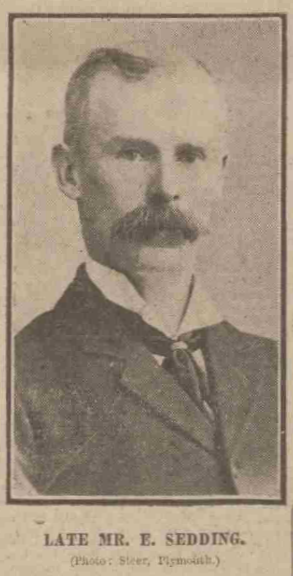 From www.britishnewspaperarchive.co.uk. Image © Local World Limited/Trinity Mirror. Image created courtesy of THE BRITISH LIBRARY BOARD. Figure 2. 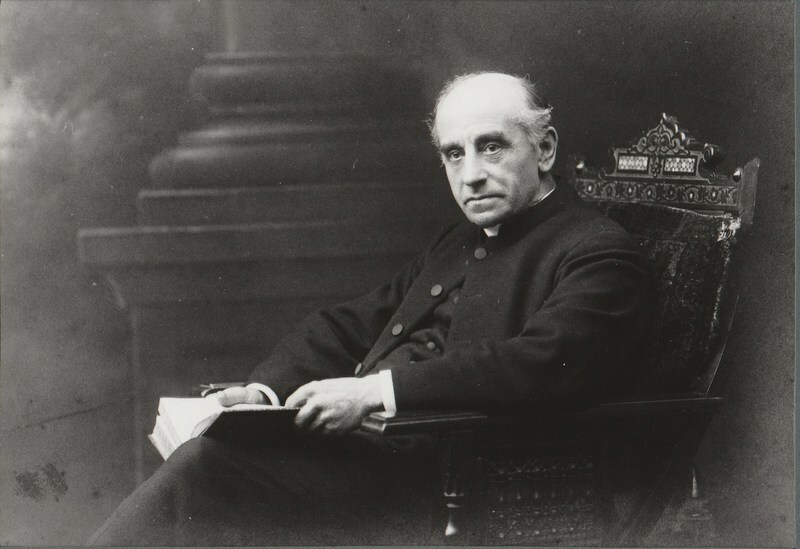 Father George Metford Parsons. The quality of the new woodwork is usually given most prominence. Rather than attempt to present a chronological account of the Pinwill carvings at St Carantoc, they have been grouped together under their form and function. This makes it easier to relate the carvings to the architectural and liturgical features of the restoration. The forms are grouped as (A) figurative carvings, (B) symbolic carvings and (C) decorative carvings. To a design by Sedding, the reredos (Figure 4) behind the High altar was one of the first fixtures of the church’s restoration to be installed.7 It contains four major and eight minor figures,8 and from the evidence of his scheme for the stained-glass windows,9 one must infer that Father George was closely involved with Sedding in their selection. The four major figures are St Peter (holding keys and book), St Patrick (with crozier and book, and a snake at his feet), St Piran (with millstone and crozier) and St Edward the Confessor (crowned with orb and sceptre). All the figures are related in some way to the early history of this church. Peter is patron of the Diocese of Exeter which in medieval times included all of Cornwall. Patrick was traditionally both a friend and patron of St Carantoc. Piran was also traditionally a friend of St Carantoc, and a typical major Cornish saint on this part of the north Cornish coast (Figures 5 and 6) Edward the Confessor’s reign was approximately when the original church became a Collegiate Foundation. The reason why the patron saint Carantoc himself is not included in the group is because he was to be the subject of all four nave windows in Father George’s scheme and is the subject of Nathaniel Hitch’s stand-alone statue opposite the main south door. Figure 7. St Itha, representing ‘They which do hunger and thirst after righteousness’. Figure 8. St George, representing ‘They that are persecuted for righteousness sake’. The side niches are occupied by eight saints chosen to illustrate the Beatitudes, with the title of each in Latin inscribed on the base.10 Firstly, St Francis (with cross and showing the stigmata on his hands) represents ‘The poor in spirit’; below is St Anselm (holding book and stylus) representing ‘The meek’. Secondly, Mary Magdalene (carrying a container) representing ‘They that mourn’; below is St Itha (carrying a book and crook) representing ‘They which do hunger and thirst after righteousness’. Thirdly, St Bridget of Kildare (carrying a crozier and lamp) represents ‘The merciful’; below is St Agnes (with martyr’s palm and sword, accompanied by a lamb) representing ‘The pure in heart’. Lastly, St Ireneus (with crozier and palm) represents ‘The peacemaker’; below is St George the Martyr (with sword and shield, slaying dragon) representing ‘They that are persecuted for righteousness sake’ (Figures 7 and 8). In conclusion, the Beatitude figures create a spatial context within the Chancel. Around the top of the parclose screens the fourteen Christian Virtues are inscribed, one for each of the misericord stalls. The Virtues link directly to the Beatitudes, and thus create a discrete reflective space highly appropriate to what was originally a medieval Collegiate chancel. The Virtues are (North) Caritas, Castitas, Probitas, Veritas, Sufficienta; (West) Sobrietas, Prudentia, Justitia, Virtus; (South) Obedentia, Religio, Reverentia, Adoratio, Pietas. One cannot help but feel that this was something dear to the hearts of both the architect and the priest, yet wonder how many of the pre- 1914 congregation and choir would have been literate enough to appreciate it! Figure 9. The rood screen. Like the carvings on the reredos, these figures face the congregation in the nave and are a statement to them of the importance of the leading figures in the New Testament narratives after the crucifixion, resurrection and ascension of Christ. The figures are so grouped that the major apostles (numbers 5–10) all directly face the nave (Figure 10). Spatially, this is significant as the adjacent south transept window in Father George’s didactic scheme shows the several witnesses to the Resurrection. It once again emphasises how the fixtures and fittings were conceived by Sedding and Father George to be read as an architectural and theological whole. Figure 11. The rood group on top of the screen. Incidentally, two saints are missing from the screen sequence. St John has of course a prominent position in the rood group on top of the screen14 (Figure 11) and St Barnabas is on the lectern below. The symbolic carvings on the nave bench ends have a theological significance equal to the figurative carvings. They were subject to a Faculty in 1906 in which the cost for the whole set was listed as £250 (Figure 13). End of bookshelf for first seat:- The Holy Trinity. The inner links state (in Latin) ‘the Father, the Son and the Holy Spirit IS GOD’: the outer links state ‘the Father, Son and Holy Spirit IS NOT Son, Holy Spirit or Father’. The rest of the north sequence launches the Gospel narrative, up to the Crucifixion. As it is a sequence, each bench end must be read right side (a) followed by left side (b). The Sacred Monogram IHS with inscription ‘Thou art the King of Glory, O Christ’. Lilies, the sacred flower of the Blessed Virgin, with the inscription ‘Hail Mary’. MR monogram—Maria Regina, surmounted by a Royal Crown. Figure 14. The Manger with a radiant star above and Crowns of the Magi surrounding a star. Crowns of the Magi surrounding a star (Figure 14). The Flight to Egypt, with the symbols of the Sphinx and Pyramid, with the inscription ‘Egypt’. Early life at Nazareth, with carpenter’s tools and inscription ‘Nazareth’. Wedding at Cana—the first miracle, with water pots and inscription ‘Cana’. ‘Palms’, with inscription ‘Hosanna’ and Crown of Thorns, INRI monogram. ‘Jerusalem’—Lamps and flowing water, with inscriptions ‘Light of the World’ and ‘Living Water’. Figure 15. Symbols of the Passion, with pillar, cords and scourges and the Five Sacred Wounds of heart, hands and feet. Symbols of the Passion, with pillar, cords and scourges. The Five Sacred Wounds of heart, hands and feet (Figure 15). Figure 16. Pentecost, with dove descending and rays of light and the Spread of the Gospel, with IHC monogram surrounded by rays and book with inscription. Pentecost, with dove descending and rays of light. The Spread of the Gospel, with IHC monogram surrounded by rays with inscription on book ‘Their sound went into all the Earth’.18 (Figure 16). Figure 17. The Church, with IHC monogram and Crown and Baptism, with Ark, dove and olive leaf. The Church, with IHC monogram and Crown. Baptism, with Ark, dove and olive leaf (Figure 17). Confirmation, with dove and inscription ‘Come Holy Spirit’. Holy Communion, with sacred host. Penance or Confession, with Bishop’s pastoral staff and crossed keys. Holy Orders, with stole, chalice and paten. Marriage, with ring surrounding a cross, a lover’s knot and clasped hands. End of bookshelf for first seat:- Alpha and Omega, with the inscription ‘The Beginning and the Ending’.24 This is an apt ending to the sequence, mirroring the Holy Trinity opposite. There is a strong connection between the schemes for the bench ends and the stained-glass windows within the architectural context of the nave and transepts. Only two of the stained-glass windows (Tower west—Nativity, and South Transept—witnesses to the Resurrection) portray pictorially the beginning and the end of the Gospel narrative. Eleven of the nineteen bench ends tell the Gospel narrative in symbolic imagery. One must conclude that both schemes were planned together and, as the windows scheme was formulated by Father George himself,25 then he also must have played a major part in drawing up the scheme for the bench ends along with Sedding. Father George’s involvement is supported by the fact that all seven sacraments are included, in accordance with his proclaimed Anglo-Catholic ritual status. One can only presume that Violet Pinwill must have been given a very detailed brief for the designs of the bench ends, and it would be fascinating to know more about the input of the studio into the finished designs. We have already remarked how the positioning of the saints’ carvings on the rood screen relate to the congregation. The three great windows on the church’s cruciform shape (the two transepts and the tower) focus on the Fall, Nativity and Resurrection, with the rood Crucifixion part of this overarching narrative. Now we can see the bench ends completing this scheme with the Gospel narrative and the Church sacraments, forming a very satisfying theological and visual whole. It is not too fanciful to imagine that Sedding and Father George planned all of this as a spiritual journey. Starting at the crossing facing the north transept Temptation and Fall window, and proceeding westwards, the viewer has the tower west Nativity window in sight whilst passing the symbols of Christ’s story. At the end of the north carved benches, the events of the Crucifixion, Resurrection and Ascension have been reached, but the viewer is also on the edge of the baptismal area of the nave containing the font and two nave windows in which baptism is a subtext.26 Turning eastwards the viewer is faced with the Crucifixion image of the rood screen, and whilst returning to the crossing all the other sacraments are unfolded in the south bench ends scheme. These carvings are therefore part of a fully integrated visual scheme of pictorial and symbolic iconography in wood and stained glass, all designed with a detailed didactic purpose at its heart. The final section examines the wide range of decorative carvings the Pinwill studio provided during the restoration. In many of these carvings, one feels that the imagination and artistic genius of the Pinwill sisters was allowed a freer rein by Sedding and Father George, and that the Pinwills were drawing on their earlier practical skills of using models from nature. Although their primary function was to enhance the aesthetic beauty of the chancel and Lady Chapel, the decorative carvings and inscriptions also provided an additional commentary on the liturgical aspects of these areas of the church (Figures 18 and 19). Figure 18. The sanctuary panelling. Figure 19. The ogee arch over the door into the vestry. The sanctuary panelling contains both a sedilia and a gilded aumbry as well as a fine crocketed ogee arch over the door into the vestry. Together they form a suitably dignified background to the richness of the Pinwill designs for the altar and stalls (Figures 18 and 19). Figure 20. Palm leaves and grape fruit motifs on the front of the altar. 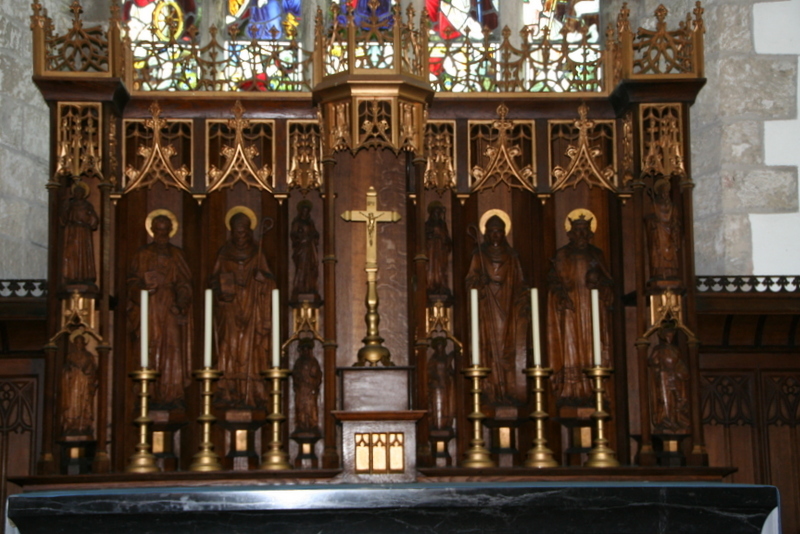 In artistic terms, there is a marked contrast between the Gothic-style reredos and the Arts & Crafts altar. The reredos, with its upper ornate open work and its elaborate gilded canopies, succeeds in drawing the eye to the sanctuary. The more restrained combination of palm leaves and grape fruit motifs on the front of the altar are of the highest artistic quality (Figure 20). Together with the un-gilded canopies on the altar front, these carvings are true Arts and Crafts products in the direct tradition of William Morris. This nature symbolism becomes the major artistic motif used by the Pinwills throughout the Chancel stalls. Figure 21. Poppy heads (pew finials) on the north choir stalls. Figure 22. Bench ends in the north choir stalls. On the north choir stalls, the pew finials or poppy heads are a whirling design of acanthus leaves around a scallop shell. The bench ends are a richly intricate design of fish and reeds or seaweed (Figures 21 and 22). The ends of the book shelves have heads of lilies above a spade motif (Christ the gardener) with ‘SC’ inscription, which could be ‘St Carantoc’ as the statue by Nathaniel Hitch in the nave has him holding his usual attribute, a spade. The back of each seat is inscribed alternately with a cross and heart, ‘M’ monogram and ‘IHS’ monogram, each separated with a traceried rose and trefoil design. The five stalls behind all have detailed misericords, most of which have motifs of various leaves and fruits. Figure 23. Poppy heads (pew finials) on the south choir stalls. Figure 24. Bench ends in the south choir stalls. The south choir stalls poppy heads consist of the trunk of a vine with leaves and grapes, and this theme is continued into the bench ends in impressive detail (Figures 23 and 24). The ends of the book shelves have vine boughs above the Passion ladder and sponge motif. The back of each seat has alternately IHS monogram, cross and heart and JR monogram, each separated with a traceried rose and trefoil design. The five stalls behind have similar misericords to those on the other side of the choir. What is remarkable about the choir stall carvings is the degree of intricate detail and variety in the designs combined with a virtuosic technique. All of this has symbolic iconography, particularly that of the Passion, woven into the overall design. (ⅳ) Priest and Deacon stalls. The most detailed and elaborate carving, however, is reserved for the two return stalls. They also afford the best view of the ends of the choir stalls immediately in front of them—a bonus for the clergy! Figure 25. 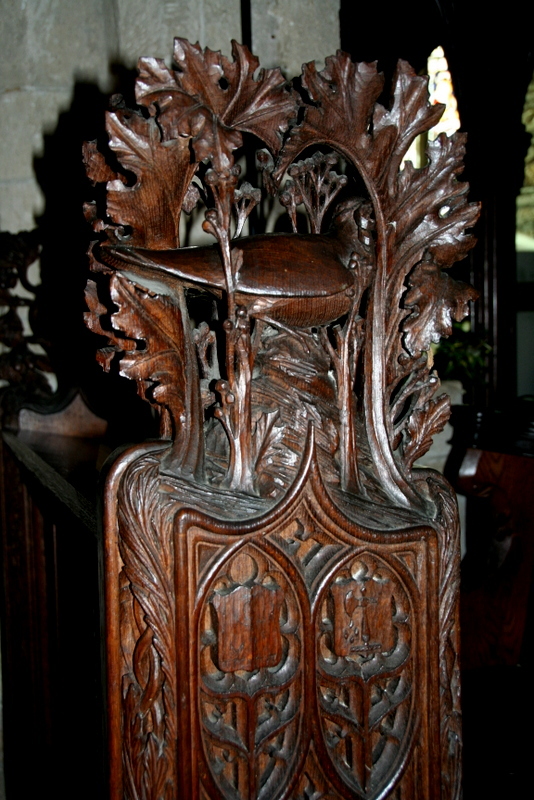 The poppy head of the priest’s stall: an oak canopy framing a dove. Figure 26. The front of the priest’s stall. The poppy head of the priest’s stall has an oak canopy framing a dove, the whole showing the most exquisite workmanship (Figure 25). The dove of the Holy Spirit is a recurrent theme of the windows in the Lady Chapel and in the ‘baptistry’ Carantoc windows in the south nave,28 where the dove also has a spray in its beak. The design of the rest of the bench end is clearly influenced by medieval models, but has a pleasing asymmetry that is decidedly modern. It includes two engraved shields, one of the sacred monogram and the other of a halberd (the attribute of Saint Matthew) with drops of blood. The front of the stall is a rich design of vine and oak with the monogram ‘JR’ in the traceried central panel (Figure 26). The two misericords show firstly a finely detailed Christ and the Lost Sheep with the inscription ‘Absolution’ and secondly an Agnus Dei with chalice and the inscription ‘Communion’. Figure 27. The poppy head of the Deacon’s stall. Figure 28. Detail of the poppy head of the Deacon’s stall, showing an an oak trunk with leaves and acorns. The poppy head of the Deacon’s stall opposite is surmounted by an oak trunk with leaves and acorns. At the wall end is a rose and hip open design worthy of William Morris himself (Figures 27 and 28). One cannot help but think that Morris’ ‘Strawberry thief’ design was an inspiration to the carver for the birds feasting on berries and fruits on the front of the stall. The central panel is inscribed ‘Seanghus Mor’ referring to the ancient code of Irish Laws with which St Carantoc was traditionally involved, and which appears in the ‘baptistry’ St Carantoc north nave window.29 The first misericord depicts the Ark and rainbow with the inscription ‘Regeneration’, and the second The Holy Dove with the inscription ‘Confirmation’. (ⅴ) Confessional Chairs in Chancel and Lady Chapel. Figure 29. The confessional chair. Figure 30. The two hinged flaps on the Lady Chapel side of the confessional. On the Lady Chapel side of the confessional the two hinged flaps are inscribed ‘Mercy’ and ‘Grace: Peace’ (Figure 30). These flaps form a table beneath the crucifix on the grill, again emphasising the significance of the sacrament of confession in Father George’s High Anglicanism. It is worth noting how each inscription is framed by yet more beautifully presented Morrisian foliage and fruit motifs. Figure 31. A roof boss in the chancel. Figure 32. A roof boss in the chancel. Before leaving the chancel, one must acknowledge the richly decorated barrel roof with its roof bosses. These were repainted after fire damage in the 1980s, but the Faculty for 1984 does not specify whether Sedding’s original colour scheme was followed31 (Figures 31 and 32). Like so many of the Pinwill carvings in the chancel, they fulfil a decorative function that follows medieval precedents, but also there are many symbolic references. Amongst the motifs on the bosses are roses, oak leaves, acorns, vines and grapes. On the string course are two praying angels facing the altar and a series of shields. One of these has seven stars, and above the altar are the sun and the moon (Figures 33 and 34). Figure 33. A praying angel on the string course in the chancel. Figure 34. A shield on the string course in the chancel. (ⅶ) Lady Chapel roof bosses and furnishings. Figure 35. A roof boss in the Lady Chapel, depicting the Annunciation. Figure 36. A roof boss in the Lady Chapel, depicting the Throne of Solomon. The roof bosses in the Lady Chapel, however, have a far more obvious didactic function, and again, as with the window scheme, one must conclude that Father George was the prime mover in the selection of the subjects: ‘the bosses in the roof above are symbolical of the Incarnation and the Blessed Virgin Mary’.32 The iconography of the bosses includes The Angel in the burning bush, the Ark of the Covenant and the Throne of Solomon, and the sacred monograms ‘BVM’ and ‘MDG’ (Figures 35 and 36). There is a direct connection with the subjects in the sequence of Marian windows on the south wall of the Lady Chapel.33 Just as with the nave bench ends and the west and south transept windows, one marvels at the level of complexity and theological argument involved in the Lady Chapel using different visual media within a defined architectural and liturgical space. The intricacies of Sedding’s and Father George’s schemes must have been influenced by Bishop Benson’s schemes with John Loughborough Pearson and Canon Arthur James Mason in the new Truro cathedral that was nearing completion at the same time as the St Carantoc restoration.34. Figure 37. The altar rails. Figure 38. The alabaster altar front. The Pinwill studio was also responsible for the delicate and complex altar rails.35 Each is in three panels, the smaller outer ones with a traceried pattern that reflects medieval bench end patterns. The larger central panel is dominated by a crown of thorns to great artistic effect. The inscription that spans both rails is ‘Hail True Body born of the Virgin Mary; Truly suffered, sacrificed on the Cross for Man’36 (Figures 37 and 38). Some of the design features in the altar rails, such as the quatrefoils, are also included in the alabaster altar front in this chapel. There is no evidence that the Pinwill studio was responsible for the altar,37 but the common features suggest that the basic designs for both commissions were made by Sedding in consultation with Father George. Figure 40. A foliate Arts & Crafts band on the side of the pulpit. The final group of carvings are the fixtures in the Transepts and Crossing. The pulpit is a traditional octagonal shape with heavily carved uprights and eight legs,38 with each side containing an open panel decorated with a foliate Arts & Crafts band. These bands mirror many of the chancel carvings alternating roses, vines with grapes and oak with acorns (Figures 39 and 40). The lectern39 has the figure of St Barnabas on the front. He is depicted holding a staff relating to his journeys, many with St Paul, and holding a book, which is usually attributed to St Mark’s gospel. Figure 41. The altar frontal chest in the south transept, showing some Symbols of the Passion. Figure 42. Medieval-style door in the pillar within the choir vestry. In the pillar within the choir vestry, there is a fine medieval-style door that almost certainly was produced by the Pinwill studio, as the upper and lower panels have their characteristic oak and vine motifs (Figure 42). The central panel of the door, however, is the Jacobean front panel from the old pulpit before the restoration. No greater compliment to the work of the Pinwill studio at Crantock could be paid than this comment. Working alongside the meticulously historical professionalism of Edmund H Sedding and the Anglo-Catholic vision of Father George, we have seen how they produced a varied and artistically inspired body of work to grace the restoration of this old Collegiate church. We have also seen how the various schemes of carvings in different parts of the church combined with that of the stained-glass windows to produce the most comprehensive theological and artistic whole that is unmatched in Cornwall or indeed in much of the South West. For all concerned, it was indeed a labour of love. The authors would like to acknowledge the help and support given by Dr Helen Wilson in the production of this article. All opinions are those of the authors. Peter Beacham, The Victorian, Victorian Society Journal , March 2014 . Michael G Swift and Jeni Stewart-Smith, A Victorian Vision re-discovered: the stained-glass windows of St Carantoc, Cornwall, Journal of the Royal Institution of Cornwall , 2014 , pp 25–42. A newer version is also available. Paul Jeffery, The Collegiate Churches of England and Wales (London, 2004 ) p 117. Helen Wilson (1), The emergence of the Pinwill Sisters, Devon Buildings Group Newsletter No 34, 2016. 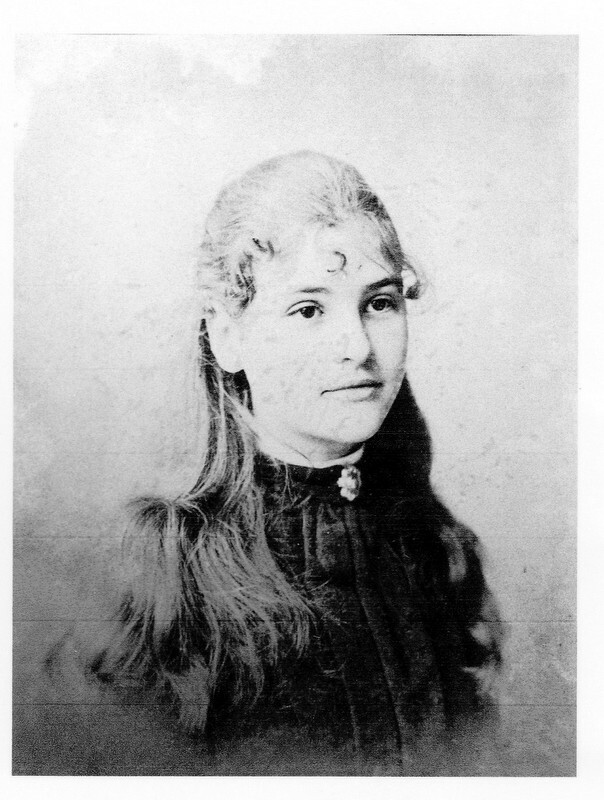 Mary left in 1900 and Ethel by 1908. Canon Michael Warner, A gazetteer of works on Cornish Anglican Churches, 1700–2000 (database items available via Diocesan House, Truro). Helen Wilson (1) op. cit. Helen Wilson (2), The Pinwill Woodcarving catalogue , section on Crantock, Cornwall. Michael G Swift and Jeni Stewart-Smith op. cit. Throughout the article, all Latin inscriptions are translated into English. Michael G Swift, A Victorian vision fulfilled—the stained glass of Truro Cathedral ( 2014 ), Introduction and Conclusion. Helen Wilson (2) op. cit. P Beacham and N Pevsner, Buildings of England—Cornwall , p 166 (Yale, 2014 ). The rood group of the crucifixion, the Blessed Virgin Mary and St John, was not carved by the Pinwill studio, but was made at Oberammergau. St Michael has always been regarded as one of the three patron saints of Cornwall. From the Norman Conquest, the Collegiate church at Crantock was in the possession of the Mortain family who carried a banner of St Michael into battle. St Michael therefore has both secular and ecclesiastic significance in the history of Crantock church. Genesis 11:9 and Revelation 21:2: Genesis 11:10 and Revelation 22:1. Ezekiel 1:10 and Revelation 4:7. Revelation 21:11: Revelation 21:23: Revelation 21:14. Michael G Swift and Jeni Stewart-Smith op. cit. Nave north 2 and south 2 windows. All the chancel stalls were inserted for the consecration in 1902 . Michael G Swift and Jeni Stewart-Smith op. cit. Lady Chapel south and Nave south 2 windows. Michael G Swift and Jeni Stewart-Smith op. cit. Nave north 2 window. Canon Michael Warner, op. cit..
Church of St Crantock—carvings and inscriptions p 19. A hand-bound, typewritten and hand-drawn booklet unsigned and undated. Michael G Swift and Jeni Stewart-Smith op. cit. Lady Chapel south windows 2 and 1. Michael G Swift, op. cit., Chapters 2 and 3. Inserted for the consecration in 1902 . The altar frontal was possibly the work of Nathaniel Hitch who was responsible for the nave St Carantoc statue. 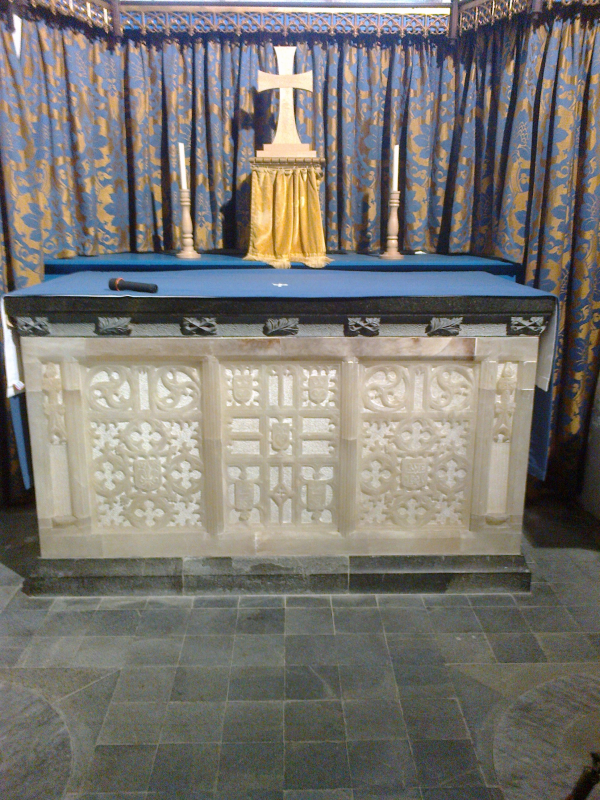 This, together with the Lady Chapel altar and altar rails were all part of the 1902 restoration. Helen Wilson (2) op. cit. This lectern was not in place at the consecration service in 1902 . Original Church inventory, 1911 : strongroom planned by Father George. Michael G Swift, op. cit., Chapter 13. It was in 1902 , in the middle of the Crantock restoration, that Truro cathedral took the decision to change from Latin to English inscriptions! Church of St Crantock—carvings and inscriptions p 18. Edmund H Sedding, Norman Architecture in Cornwall , p 71. London, 1909 .